The Golden Palms Hotel, Patparganj, Delhi is great for small functions like birthdays, anniversaries, family get-togethers and pre-wedding functions. The green belt around lends serenity and the contemporary interiors of the banquet hall beautify the venue and make it more appealing. Hotel Golden Palms Patparganj serves flavoursome delicacies to choose from in both vegetarian and non-vegetarian food to their guests. The decor team takes care of the decoration for your big day. The Golden Palms Hotel & Spa, Patparganj, Delhi has well-designed rooms that are imbibed with luxury and comfort. The venue offers complimentary changing room for the bride and the groom on their special day. Golden Palm Patparganj serves alcohol and also allows you to get it from outside to entice your guests. The venue offers ample car parking space to your guests for their convenience. So go ahead and book The Golden Palms Hotel, Patparganj, Delhi for your upcoming events. 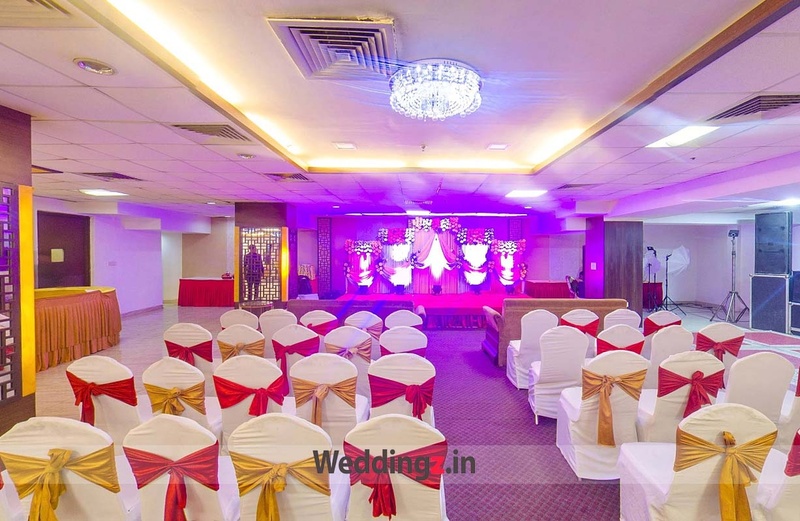 The The Golden Palms Hotel located in Patparganj, Delhi has Wedding Hotels, Cocktail Venues, Banquet Halls and 5 Star Wedding Hotels. Nilaya can accommodate upto 50 guests in seating and 120 guests in floating. Nirvana can accommodate upto 100 guests in seating and 200 guests in floating. Vegetarian and Non Vegetarian food is served at this venue. Features of this wedding venues are : Food provided by the venue , Non-Veg allowed at the venue , Alcohol allowed at the venue , Outside alcohol allowed at the venue , Music allowed late , Halls are air Conditioned , Ample parking , Baarat allowed , Hawan allowed , Overnight wedding allowed , Decor provided by the venue , Packages starts at Rs 1300 per plate for vegetarian menu and at Rs 1500 for non veg menu. Decoration starts at Rs 30000.